Mom, this one’s for you. And for anyone else not at my sister and her soon-to-be hubby’s new home in Oklahoma as I helped to break in their kitchen with a quick, simple, almost vegetarian dinner menu. 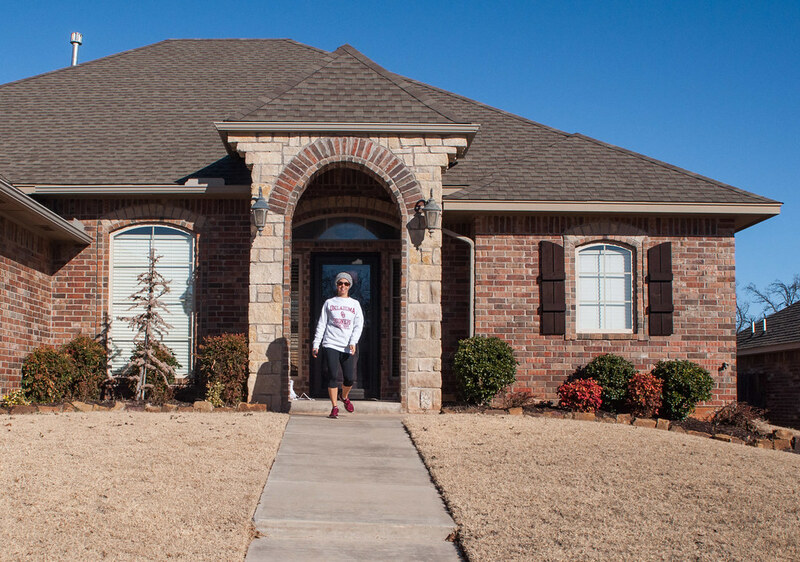 My parents and I traveled from our respective homes for what happened to be an accelerated closing date on the house, Thanksgiving weekend, and Toryn’s Oklahoma bridal shower. We just love action packed weekends, I guess. Luckily Toryn was way more relaxed about the whole thing than I would have been in her position, as we invaded the guest room and man cave of their new space and demanded to go sightseeing. Instead of insisting on setting up the new kitchen and getting precious WiFi installed, as I would have done, Tor and fiance took us out to OKC’s cute shops and stellar coffee, to the memorial for a moment of reflection, for Mexican food and cupcakes (and margaritas), and for Eischen’s famous fried chicken (and a Bud Light) an hour away. In the midst of all that, we got comfy on the sofa to watch Van Wilder’s Christmas movie on a tiny monitor, over this here dinner and some wine. Meanwhile, my mom made a full recovery from her previous day’s stomach bug (i.e., hit the sack at 5 PM). Of course I would have liked to do something more complicated and elaborate, but we had a busy day of moving and sightseeing, and grocery shopping didn’t even happen until something like 6:30 PM. At Wal-Mart. And in case you’re in a “remote” part of the country–they did have everything I needed for this menu, even though I didn’t find the pine nuts until my third scrub of the grocery aisles. I try not to judge a book by its cover, but my intuition told me that the flip-flop and neon vest wearing grocery staff was not all too familiar with pine nuts. 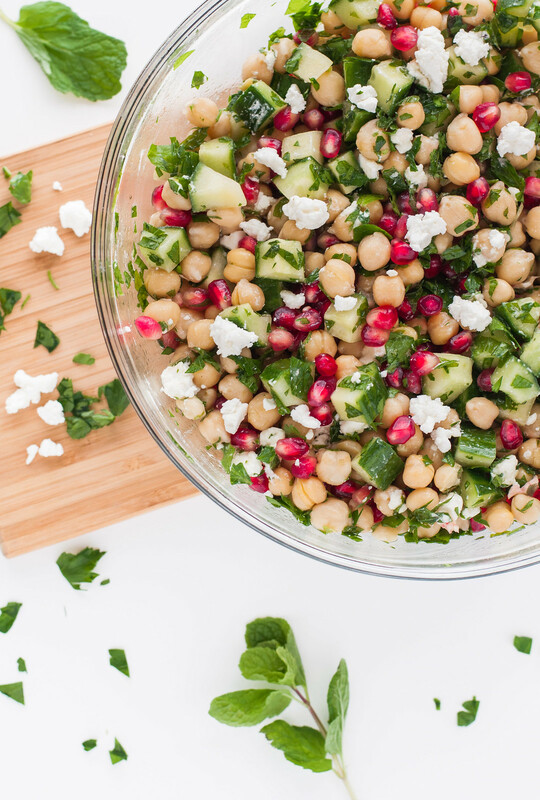 I’ve done variations of this chickpea salad before (like the one in my eBook, which you can get for free here), but this one looked so festive for the holidays with all the juicy little pomegranate seeds that it’s worth remembering. The recipe is straightforward enough, but the appeal lies in the combination of textures. 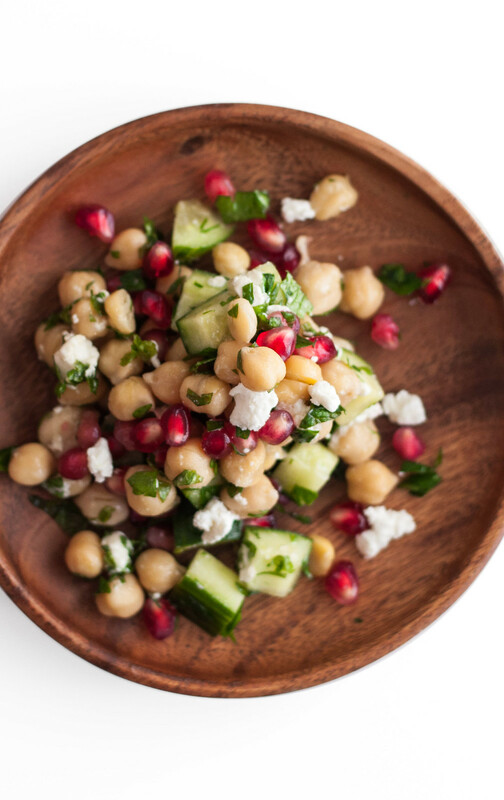 Chickpeas that can be described as nothing else but meaty, crunchy cucumbers, pomegranate seeds that burst with juice in their peak winter season, creamy and salty feta, and bright herbs, all brought together with a simple “dressing” of olive oil (break out your best for this) and tart red wine vinegar. Yummy in my tummy. Oh, and some of the appeal may also be in the redeeming 15 minute prep time. 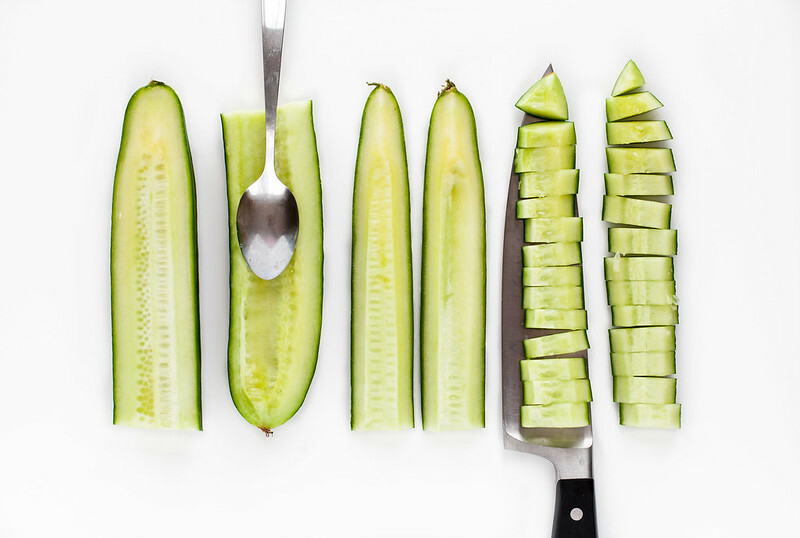 It’s effortless to whip up this salad for any vegetarians or healthy food lovers (me!) at your next party, or the day after a not-so-healthy celebration, when your body is looking for all those good things that it did not find in 4 champagne cocktails, cheesy dip, and a late night pizza. Not that I would know annnyyyything about that. 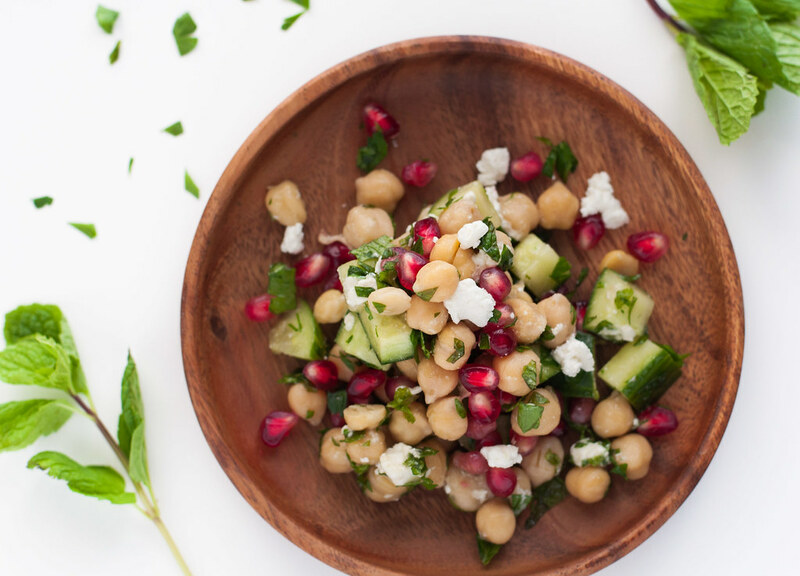 Crossing classic Greek salad with herb-focused tabbouleh, and this might be the result. Chickpeas form a meaty, filling base and sweet, juicy pomegranate seeds punctuate every festive bite. 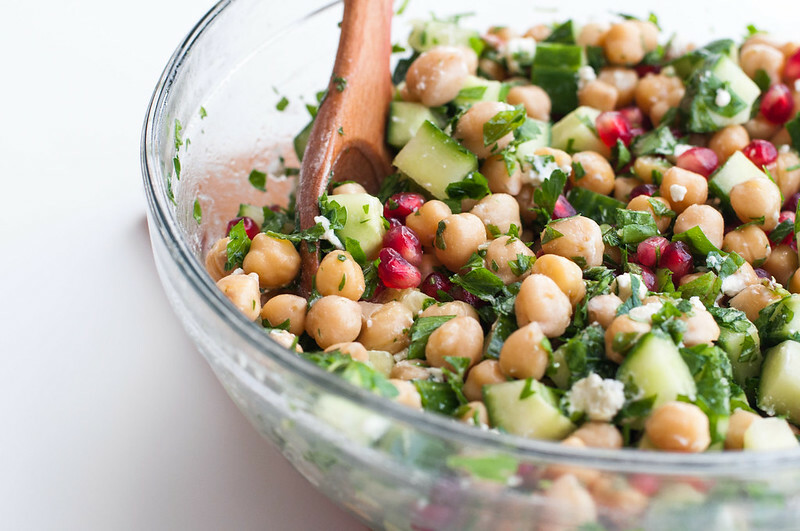 Combine chickpeas and chopped cucumber in medium mixing bowl and toss with olive oil and red wine vinegar. Gently stir in pomegranate seeds (reserving a few), mint, and parsley. Season with pepper. 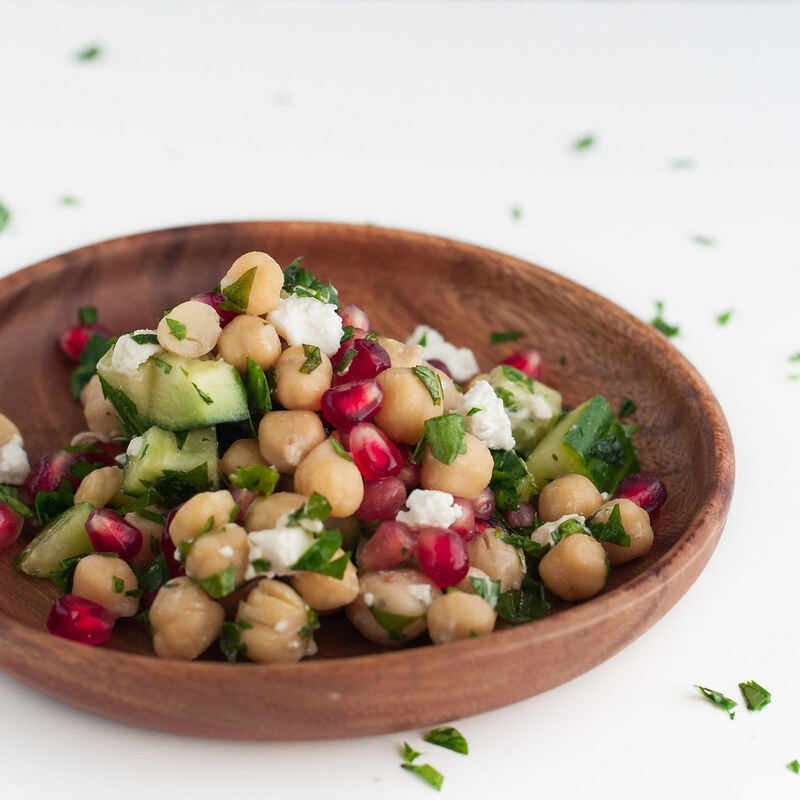 To serve, sprinkle top of salad with feta and garnish with remaining pomegranate seeds. The feta provides saltiness, depending on which type you use (I like Bulgarian feta the best). I serve the salad with salt nearby, but I don't salt it in the serving dish. 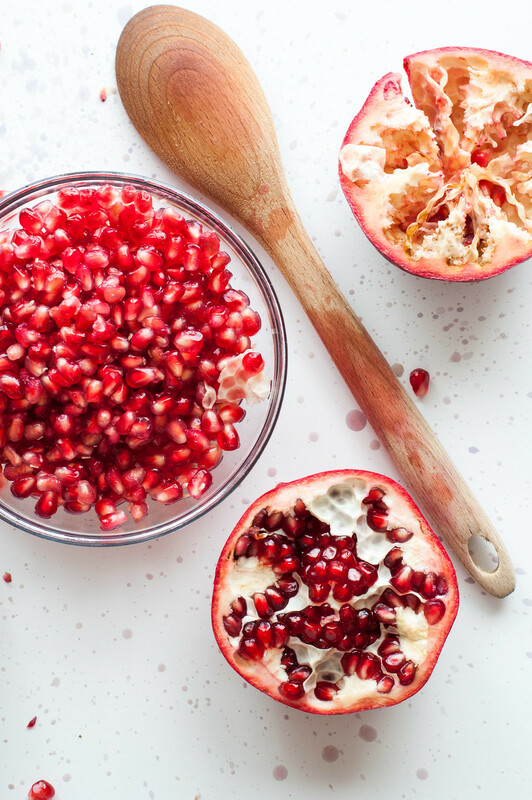 The recipe is flexible--feel free to adjust proportions of herbs, feta, or pomegranate to your preference. The combination I use is fairly balanced and not too heavy on cheese. Salad keeps a few days in the refrigerator as leftovers. If serving for dinner or at a party, make it the same day so the ingredients maintain their best texture.